In the 1960s many rock bands were funny some of the time; only a few made humor about as much of the act as music was. 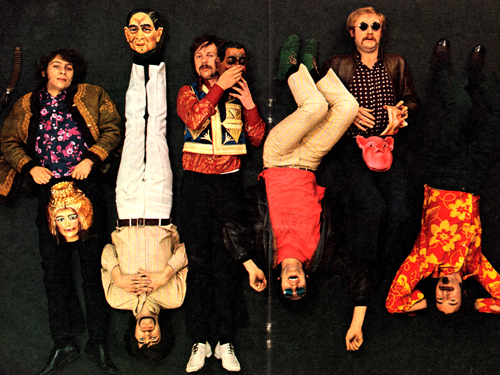 In the U.S., only two such bands did so with consistent brilliance: the Mothers of Invention and the Fugs. The international, and kinder and gentler, branch of that triangle of major rock comics was represented by England’s Bonzo Dog Band. The Bonzos had only one big hit in the U.K. with I’m the urban spaceman, and some Beatles-glamor-by-association due to a cameo appearance in the Magical mystery tour film. In the U.S. they remained a cult band. Sometimes compared to the Mothers of Invention, particularly in their zany stage shows and their facility for parodying multiple pop genres, the Bonzos lacked the savage cynicism that powered Frank Zappa’s brand of wit. As compensation, they offered a more whimsical, surreal take on the absurd that was in some ways more sonically versatile, encompassing not just rock but also prewar music hall, jazz, and spoken word. This according to “The Bonzo Dog Band” by Richie Unterberger, an essay included in Urban spacemen and wayfaring strangers: Overlooked innovators and eccentric visionaries of ’60s rock (San Francisco: Miller Freeman, 2000, pp. 109–121). Below, the Bonzos perform Death cab for cutie, the song that the American alt-rock band took for its name; the performance starts around 0:50.